General Math is a vital subject for Secondary School Certificate (SSC) exam 2020. Today we are going to provide 2020’s best ssc suggestion and question paper for general mathematics. Students find it difficult to obtain good marks in this subject mostly because of their wrong strategies and carelessness. The fault of the teachers in this regard is also mention-able. Of all the subjects which are ordained by the ministry of education, mathematics is the hardest to deal with. This subject requires proper understanding and retention. One cannot get good marks by only memorizing the rules and procedures. If a student does not have a clear concept about this subject, he/she cannot expect a good outcome. But there is nothing to worry about because we are offering you the best suggestions and guidance which will be a great help for your final preparation. Download All Subjects Suggestions. In the case of General math 70% marks have been kept for the written section and 30% marks are for the MCQ section. The mark distribution is slightly different in Higher math. Here 50% mark is for writing, 25% is for MCQ and the remaining 25% is for the practical section including the viva voce exam. In order to get GPA 5, a student must do well in both written and objective part. 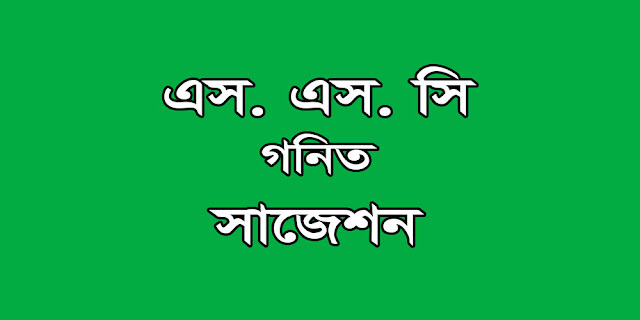 Education in Bangladesh is overseen by the ministry of education. There are eight educational boards in Bangladesh. 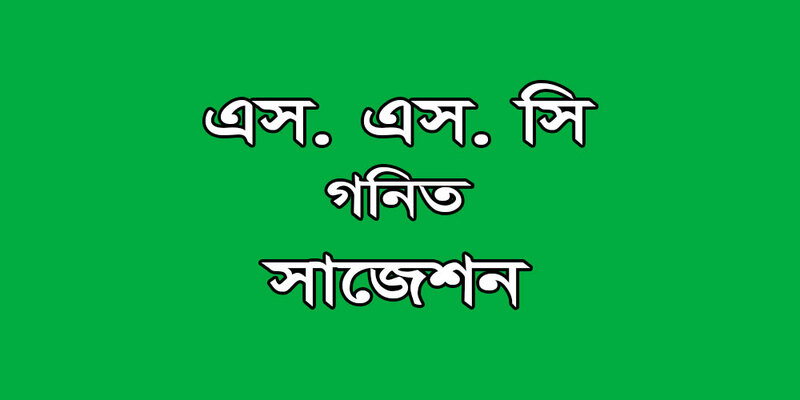 They are Dhaka, Rajshahi, Chittagong, Comilla, Dinajpur, Sylhet, Barisal, Jessore, Technical, Madrashah. SSC exam is executed under these eight educational boards. Though the questions of these boards are different from each other, the question pattern is same everywhere. All the boards will set the questions according to the SSC math syllabus. For SSC examination students need to study two kinds of math- General math and Higher math. 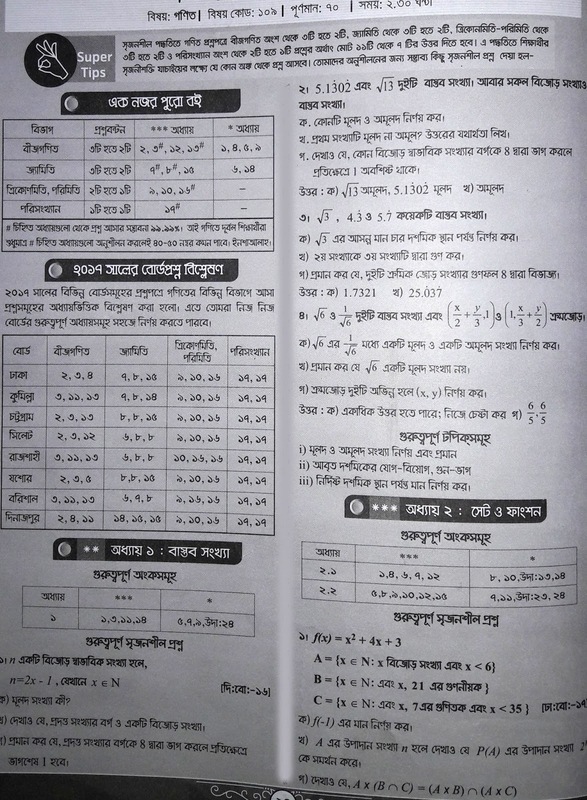 Here General math is compulsory for all students and Higher math is only for the students of science group. You have to bear in mind that, you have to pass in both the sections individually. Otherwise you will be marked as fail. In the MCQ section you have to choose the correct answer from the given four options. MCQ questions can be set from anywhere of the book. So, you have to go through all the chapters and have to know every nook and corner of the book. But don't worry. Here we are providing you with some exclusive tips and notes which will be very much beneficial for your preparation. If you are from business/commerce group, I do believe you would like SSC Accounting Suggestion, SSC Business Entrepreneurship Suggestion and SSC Finance Suggestion. Now a days leaking question has become a regular affair which is absolutely illegal has become rampant throughout the country. You can cut a good figure in the exam answering questions leaked out but one stage you will have to pay for it. So, it is better to depend on your own intelligence rather than doing something illegal. If you are from Arts/Humanities group, you may download the suggestions of SSC History of Bangladesh & World Civilization, SSC Bangladesh & Global Studies, SSC Civics, SSC Economics, SSC Geography & Environment. Most of you may think that, math section is difficult and time consuming. However if you analyze the previous year questions from all the board and try to understand the main themes properly rather than memorizing it, you'll find math interesting and will be able to overcome the fear in this subject. If we look at the last 5-6 year's SSC questions, we will find that, there are 2-3 questions in each section which had been repeatedly given in the exam. It is therefore necessary to solve previous question papers for a better result. Math questions are set from all the major topics like Arithmetic, Algebra, Geometry, Menstruation and Trigonometry. In the case of written examination, you have to write answers of creative questions from various sections. You will find some amazing creative questions set according to the question pattern of 2020. It will be very helpful for your last minute preparation. But always remember that these are only suggestions. We can't guarantee that you will find exactly these questions in your board exam. In order to get a good command over math, practice is a must. Practice not only makes a man perfect but also indoctrinates confidence inside an individual. By practicing more and more you can remove all the ifs and buts from one's system and you'll be able to do any math. For a good preparation you have to identify your weak points and you must have to try to get over it. As you have to write the answers of creative questions, memorizing blindly won't come to any help to you for passing the examination. In our site you will find everything necessary for your preparation including syllabus, short notes, question pattern, collection of previous year questions and exclusive suggestions. Here everything is arranged according to your needs. That is why you don't have to waste your time collecting information as you will get all the important things in a whole in our site. Students can't do well in math because in most cases they use shortcuts and tricks which are comparatively easy to remember and apply. But it must be kept in mind that tricks and shortcuts are undoubtedly helpful, but without basic concept you will not be able to use them effectively. Besides, it is said that, "There are no shortcuts to succeed ".And the fact is, shortcuts and tricks might ditch you at the last moment but basics will not. Another reason behind any student's failure is lack of strategy and carelessness. If the students follow a routine and try to maintain it properly, they will definitely cut a brilliant result in the examination. In addition to these, regularity must be maintained strictly. Otherwise there is a probability of forgetting the rules and procedures of math. Again, many students don't get proper guidance and they fail to make the right strategy. In this case, you can seek help from their teachers because strategy is very much important for any preparation. This not only opens the door to success but also saves a lot of time. 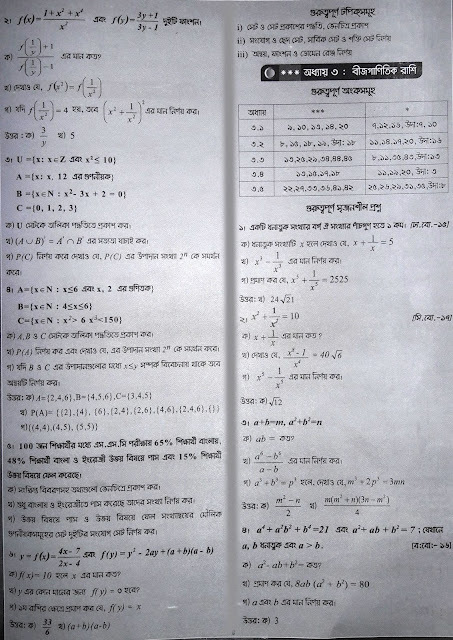 If you follow the above mentioned things, there is a good possibility of cutting a standard figure in SSC mathematics.